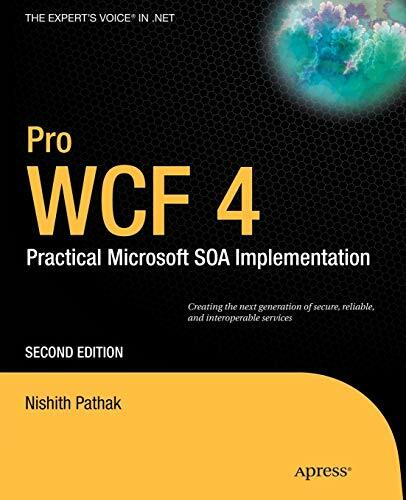 Pro WCF 4.0: Practical Microsoft SOA Implementation is a complete guide to Windows Communication Foundation from the service-oriented architecture (SOA) perspective, showing you why WCF is important to service-oriented architecture and development. This book provides deep insight into the functionality of WCF, which shipped with .NET 4.0-like service discovery, routing service, simplified configuration, and other advanced features. Included in this title are informative examples that will aid the reader in understanding and implementing these important additions. This book also covers the unified programming model, reliable messaging, security, and the peer-to-peer programming model. You'll also learn how to move your current .NET remoting and web service applications to WCF, and how to integrate those applications with WCF 4. This book offers genuine insight into solving real enterprise problems using WCF and .NET 4.0. Nishith Pathak is a Microsoft "Most Valuable Professional" (MVP), reviewer, published Apress author, speaker, and Microsoft purist who has been working on the .NET platform since its early beta days. Nishith was born, raised, and educated in a town called Kotdwara in Uttaranchal, India. His expertise is in delivering enterprise solutions to Fortune 100 companies spanning the globe. He is a contributing author and an avid technical reviewer for multiple electronic and print publications. Over the years, he has also been involved in providing consultancy and training services to corporations. Nishith is a frequent speaker and conductor of webcasts for Microsoft India and user groups on various upcoming technologies. Currently, he is focused on key areas of the Microsoft platform, specifically distributed computing, service orientation, exploring Vista, and helping companies architect solutions based on service-oriented architecture (SOA). You can contact him at nispathak@hotmail.com and visit his blog at http://dotnetpathak.blogspot.com.